I am back with another layout. I actually got caught up on my scrapbooking over the Christmas holidays. I spent one hour here and there during my vacation, in between shopping, baking and wrapping gifts. And before I know it, I finished 24 layouts! Yes, 24 layouts covering our September to December! It felt really great to be starting the year without any backlog. So anyway, back to my layout... I made one for our apple picking outing last September. The weather and my daughter cooperated that time so I was able to take great photos of that day. I used Papertrey’s modern alphabet dies, loop de loop die, Fruit Fusion: Apple stamp and die, Lovely Layers die for the small flower, twine, some distressed dots patterned paper and black cardstock. I also used Simple Stories’ Summer Fresh collection (have I told you how much I love that patterned paper?). 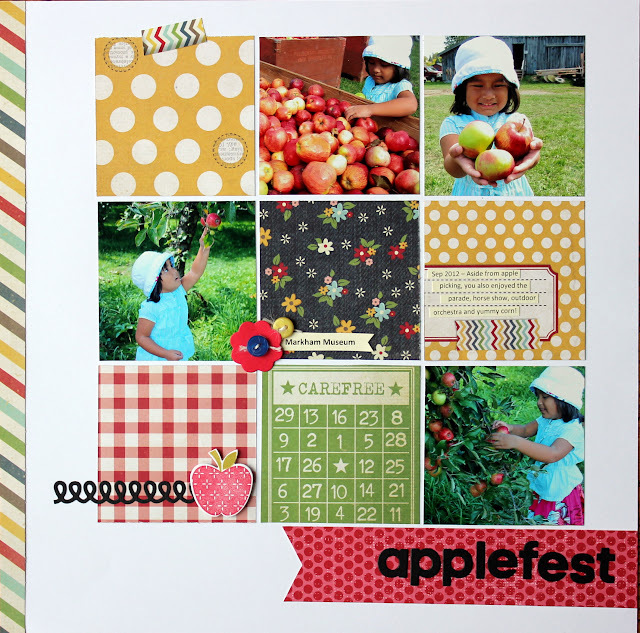 Great grid design, Irma and those patterned papers are perfect for those photos! Beautiful! Love the quilting effect with those different papers. Perfect choices for an apple-picking layout!